AZ Drive Thru Storage provides secure storage solutions to homes and businesses throughout Mesa, AZ and beyond. You can find us near several apartment complexes including VIllage Green Apartments, The Courtyard Apartments, San Jose Manor Apartments, Emerald Apartments and Friendship Village. We’re also close to Mesa Community College so we’re a great place for students who need extra space. Call us or come by to reserve a unit today! Turn into the iconic Filiberto's to access our entrance. We promise that you won't be disappointed! Our professionally managed self storage facility is both affordable and packed with top amenities. Customers simply love the convenience of our drive-up access and UHaul truck rental availability. Instead of carrying your belongings across the facility, you can simply park your vehicle right outside your unit and unload directly inside. Meanwhile, our resident manager is always available to answer questions, provide assistance and keep a watchful eye on your unit. With our state of the art surveillance cameras, our storage units are the most secure around! If you need more boxes, tape or other supplies while at our facility, you won't have to make a special trip in order to stock up. Here at AZ Drive Thru Storage, we sell various packing supplies at competitive prices for your convenience. Likewise, our online bill payment system is a quick and easy way to keep up to date on your rent. Instead of mailing your payments or driving to our office, you can simply pay your bill with your computer or cell phone. If you have any questions at all, please don't hesitate to contact us. A member of our friendly and professional team is waiting for your call. I have been coming in every month for the last 3 years. Love our little talks. I am sorry to see you go. Thank you for all you have done. I rented a truck and a unit from this location. This truly is a one stop shop! 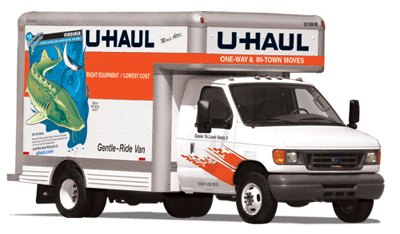 convenient and affordable moving truck rental options.